Nothing but positive things to say about Planet Travler. It's a great hostel. Everyone there (both staff and travelers) were super friendly. Good community feel. Also, fantastic location. Absolutely loved the daily events! Really great place to stay in a cute neighborhood of Toronto, and super convenient parking for just 10 dollars a day. All the staff members were readily available, helpful and friendly- thanks especially to Tina for the warm welcome! Rooms and common spaces were clean; bathrooms were refreshed every day. Pure and simple hospitality is alive and well here. One of the best hostels I’ve ever stayed at. Super modern, clean and and friendly with an awesome vibe. The most expensive hostel I’ve ever stayed in but isn’t a lot more expensive than others in the same area. The free breakfast until 1pm (breakfast and lunch for cheap skates like me), free popcorn and rice and towel hire balance it out though. One small suggestion would be to put a mirror in the rooms (especially the girls rooms) so the bathroom line up in the morning isn’t so long. This is a great hostel, good vibes. Only con- wish the rooftop common area was open past midnight. Will definitely stay here again. 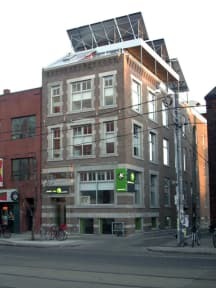 This was a great little hostel in the perfect location in Toronto. We had an amazing time and rebooked. It has really good vibes! This hostel is in a good location. The building itself is ideal for a hostel and you can tell a lot of thought went into the design. I stayed in a 6 person dorm. It was good to have the lockers separated from the bedroom so if people needed to get into the locker at night or use the restroom, they wouldn't wake you up. Beds were just ok, but cant complain too much!Best part of the hostel has to be the roof. It provides a nice place to socialize. 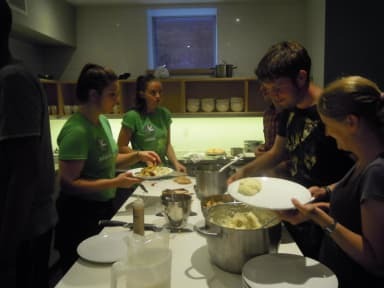 The hostel provided a free dinner on one night. Had a great time! Staff very friendly and helpful. Met some great people at the hostel. Great location and easy to get to. Rooms were clean with individual lights and plug sockets. I arrived after 12am and the staff were helpful to enable me to get into my room even thought reception was closed. Stayed here a few times.